#5 Oregon State traveled to #18 UCLA and beat the Bruins 7-5. #14 Oklahoma were shut out by Taylor Jungmann and #8 Texas 5-0. #9 Florida State had a strong win on the road against red hot #21 Miami 6-5. #17 Stanford lost @ #7 Arizona State 12-10. Gerrit Cole – RHP – UCLA – Jr. 4.1IP 10H 7H 3BB 5K. (L, 4-5) Loss against #5 Oregon State. Tyler Anderson – LHP – Oregon – Jr. 7.2IP 6H 1ER 1BB 8K. Good performance against #22 California. Brady Rodgers – RHP – Arizona St. – So. 7IP 8H 2ER 0BB 8K. (W, 6-2) Over Mark Appel and Stanford. Andrew Triggs – RHP – USC – Jr. 7.2IP 6H 1ER 2BB 4K. Erik Johnson – RHP – California – Jr. 8IP 4H 1ER 3BB 11K. Sam Gaviglio – RHP – Oregon State – Jr.6IP 6H 5ER 7BB 0K. (8-1). 7BB 0K….W?? Kyle Simon – RHP – Arizona – Jr. 6.1IP 9H 3ER 1BB 2K. 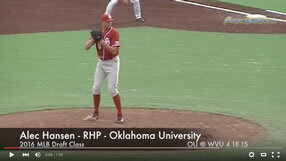 Hudson Randall – RHP – Florida – So. 7.1IP 6H 3ER 0BB 6K (W, 8-1). Michael Roth – LHP – South Carolina – Jr. 8IP 7H 1ER 1BB 6K. Kevin Gausman – RHP – LSU – Fr. 7IP 2H 1ER 3BB 8K. Kurt McCune – RHP – LSU – Fr. 6.1IP 7H 2ER 2BB 7K. Thursday. Alex Meyer – RHP – Kentucky – Jr. 7IP 4H 3ER 2BB 10K. Thursday. Taylor Jungmann – RHP – Texas – Jr. 9IP 4H 0ER 1BB 9K. (W, 10-0). Jungmann has a 0.90 and teams are hitting .158 against him. John Stilson – RHP – Texas A&M – Jr. 6.2IP 9H 6ER 2BB 7K. TJ Walz – RHP – Kansas – Sr. 8IP 5H 1ER 3BB 4K. Sean Gilmartin – LHP – Florida St. – Jr. 7IP 6H 3ER 4BB 6K. Cory Mazzoni – RHP – NC State – Jr. 7IP 8H 5ER 2BB 12K. Randy Fontanez – RHP – USF – Sr. 8IP 6H 0ER 0BB 9K. (W, 5-3) Out dueled conference foe Kyle Hansen of St. John’s. Carson Smith – RHP – Texas State – Jr. 8.1IP 4H 1ER 3BB 13K.